Mr Liam Young M.V.B. M.R.C.V.S. 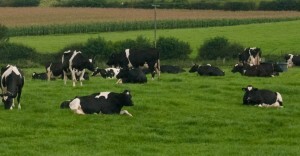 gradCERT DHH, completed a specialist course in dairy herd health in 2012. Liam can provide specialist advice on all aspects of dairy herd production such as calf health, fertility and nutrition. We can advise on all aspects of calf health from birth to weaning such as colostrum protocols etc. Advise on prevention of diseases such as pneumonia and diarrhoea. We can provide advice on all aspects of heifer rearing so that targets are met. We can provide advice on dry cow and lactating cow nutrition. We can examine a bull’s fertility. Liam provides routine fertility visits using a recently purchased state of the art Ultrasound scanner.